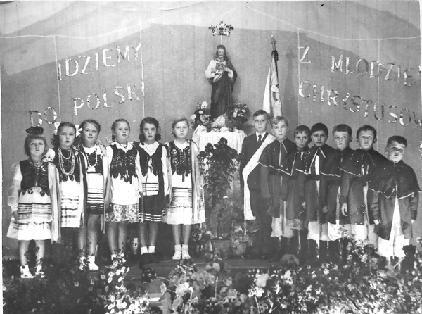 On Saturday mornings we attended Polish classes in the camp where we were taught Polish history, culture and traditions. 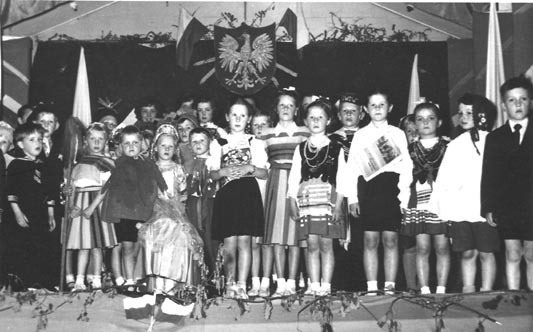 We learnt Polish songs and dances and took part in national celebrations, like the 3rd of May Constitution, Independence day on the 11th November and other national days. 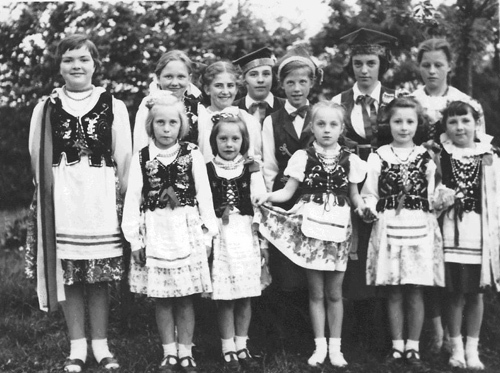 Most children had some kind of traditional Polish dress made for them by their mothers, usually it was from the Krakow area "Strój Krakowski" which was worn at every opportunity. 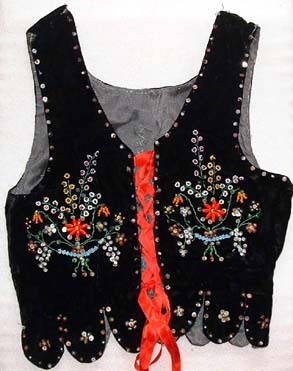 The colourful skirts, white blouses and aprons were straight forward to make but the black velvet bodices embroidered with beads and sequins, took a lot of time and patience. Every design was different. 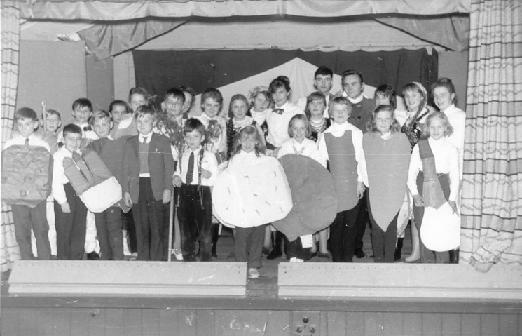 Many plays and performances were done by the children helped by teachers and parents and they were always very popular and well attended and much appreciated by the older inhabitants of the camp. 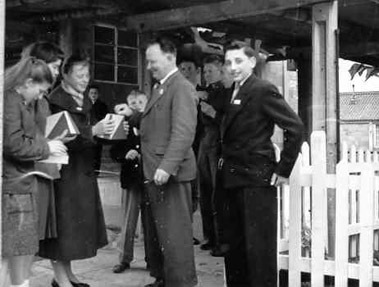 Many of the younger children seen here were born in the camp. 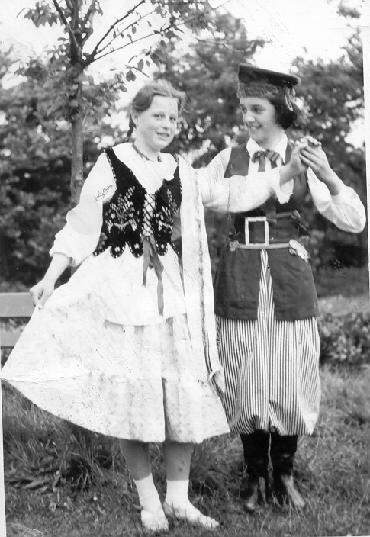 Left:- 1958 - Zosia Hartman and Danka Borowska dressed in a Kraków outfit. Each national costume was individually sown by mums embroidering the velvet bodices with beads and sequins and every design was different. 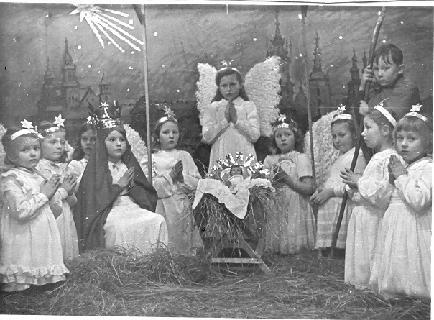 Front row:-Marysia Borowska, Jasia Borowska, Ala Benbenek, Misia Świdwinska and Zdzisia Jarosławska. 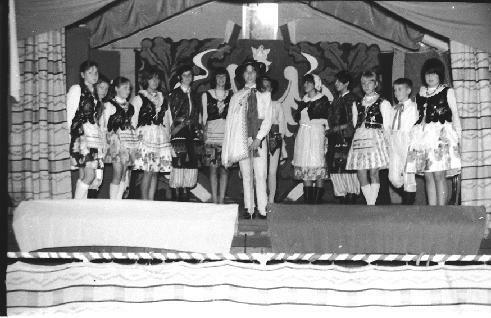 Back row :-Basia Bedryjowska, unknown, Inka Tunikowska,Basia Arbaszewska, Teresa Bojarska, Danka Borowska, Zosia Hartman. 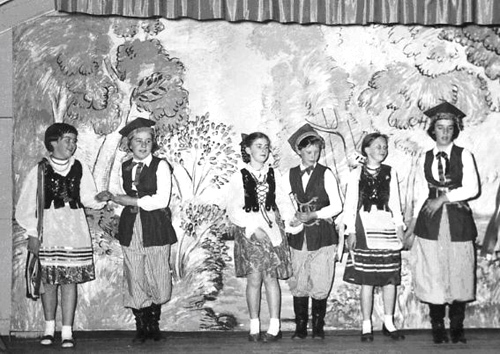 -Basia Bedryjowska, Basia Arbaszewska, Inka Tunikowska, Teresa Bojarska, unknown and Danka Borowska. 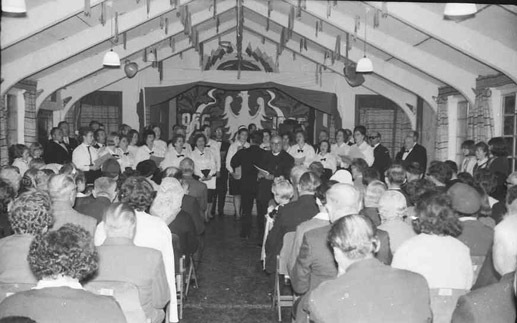 Living in a close knit community there are many Polish traditions that were passed on from our parents. 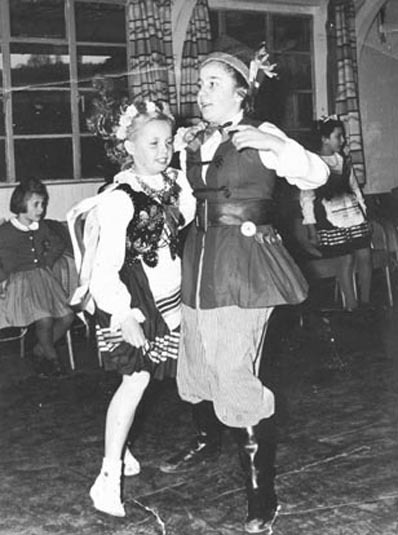 Most of us embraced these traditions and on leaving the camp tried to keep them alive at home and in the many Polish clubs that sprung up all over the country where Poles moved to and settled. In a lot of cases we have passed on these traditions to our children and grandchildren. Like St Nicholas day on 6th of December when small gifts are given to the children in memory of the Saint. On Christmas Eve the whole family sits down to a traditional evening meal consisting of twelve dishes, like "barszcz" (beetroot soup), "pierogi", "śledzie" and carp served in various ways. After the meal we gather round the Christmas tree and open our presents, finishing off the evening with Midnight Mass in church. 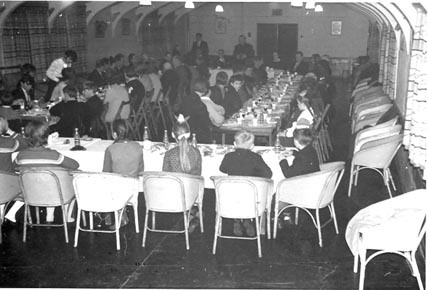 At Easter time food, consisting of Polish sausage bread and bright hand painted Easter eggs (pisanki), is taken to church to be blessed..
Christmas party held in the camp in 1956 with some children dressed in national costume. They were entertained by 'May Ling', a magician from Blockley. 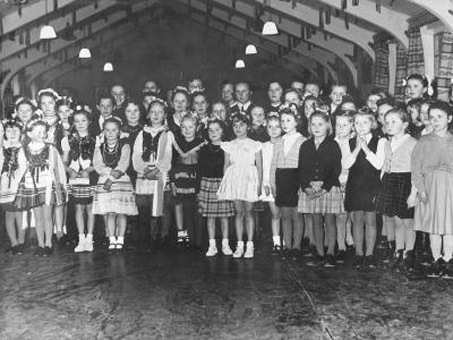 Children's party in the main hall of the camp, organised by the camp's youth. Inka Tunikowska, Basia Bedryjowska, Zosia Hartman, Mr Rymaszewski and Jurek Danyluk collecting for the Polish Education Foundation, "Polska Macierz Szkolna". 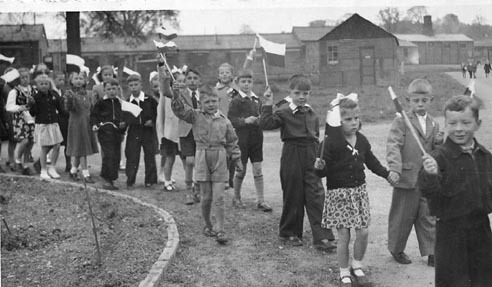 School children on their way to church to celebrate Polish Constitution Day, May 3rd 1954.